Wasps' head coach Mel Mansfield said Rachel Dunn was "as steady as anything" after her 200th Vitality Netball Superleague appearance, and with her form such a description is not unexpected. At 36 years young, she is playing some of the best netball of her career; the type that changes matches and raises your profile even further on both the domestic and world stages. To do that after so many seasons is impressive and after the type of disappointment that she felt last year takes great resilience too. Superleague netball was launched in 2005 and on Sunday, October 22 Dunn was named in Team Bath's line-up for their match against Loughborough Lightning. Alongside Dunn were some familiar faces including Sky Sports' Tamsin Greenway and Pamela Cookey and Geva Mentor, facing them of Olivia Murphy, Karen Atkinson, Ama Agbeze and Jade Clarke. Since that point the experienced shooter has won seven titles, including one at the end of that first Superleague season with Bath, and has an eighth in her sights with a motivated Wasps team. Internationally Dunn first put on an England Netball dress in 2004 and has two Commonwealth Games bronze medals to her name (2006 and 2010). Dunn's initial step from domestic netball to the international stage is one that Sky Sports expert Greenway remembers well. "Rach got into the England squad a year before I did and it was really interesting because if you look at what coaches do now they'll pick combinations and they do that in all sports," Greenway said. "So if you're going to take Jamie Vardy to the World Cup, play him with Danny Drinkwater. Don't expect someone else to play and make it happen. That's the combination. But that was the problem with the Rach, they took her without us. "Our combination was always great and if you look over the years in the England squad we had very limited time where we ever started a game together or actually played a game together and it's just stuff like that it doesn't happen now. "I've built teams around her at Storm, at Wasps and that happened at Bath as well that's why she is such a terrific shooter because if you allow Rach to be Rach, which is a bit different to a lot of other shooters, it will be lethal." Fast forward 14 years from her debut and Dunn's international career did not include selection for last year's gold medal-winning squad at the Commonwealth Games, something that she will not forget in a while. "It was massively tough missing out on the Commonwealths - it's always hard missing out on such a big event, but England won it so they picked the right squad," said Dunn at the recent Netball Quad Series. The selection decisions for July's Netball World Cup are going on right now and Dunn has done all she can to put herself in the shop window after seizing the day against the Australian Diamonds at the Copper Box. Jo Harten and Helen Housby may well remain as Neville's first-choice duo, however, behind them several younger players are being to emerge. Kadeen Corbin and Natalie Haythornthwaite provided the additional shooting options on the Gold Coast, youngsters Ellie Cardwell and George Fisher are pushing hard so for Dunn it's about continuing to show why her point of difference is the one that's needed in a few months time. So what exactly is that point of difference? Here's how Manchester Thunder's assistant coach and the Northern Ireland head coach Dan Ryan sees it. "That's the beauty of Rachel Dunn - she can move and she can hold. She's a bit unorthodox with the way in which she sets up her angles in the circle," said Ryan live on Sky Sports during his commentary of the second quarter against the Diamonds. "As she is unorthodox it's hard to play against as well. That unpredictable nature of her angles is actually quite a weapon." So often you will hear international head coaches talk about the value of the players that do not make the matchday squad for that World Cup final or Grand Final and for Greenway, Dunn's potential place in the squad for Liverpool is further enhanced by the way in which the shooter conducts herself in and around a squad. "She's just a great person and off the court as well, I think what people don't understand and a lot of England girls I've talked to have brought this up, is that having someone like Rach in the team is crucial," said Greenway who has been a team-mate of Dunn's in every team that they have played in since they were 18-years-old. "She's happy to sit on the bench, yes she wants to be on the court but she is a team player and not many players are like that. She will literally look after the team on and off the court and just loves the game. "And, I tell you what when you walk on as a WA you want to look into your shooting circle and have a Rachel Dunn because you know that you're going to be in business." 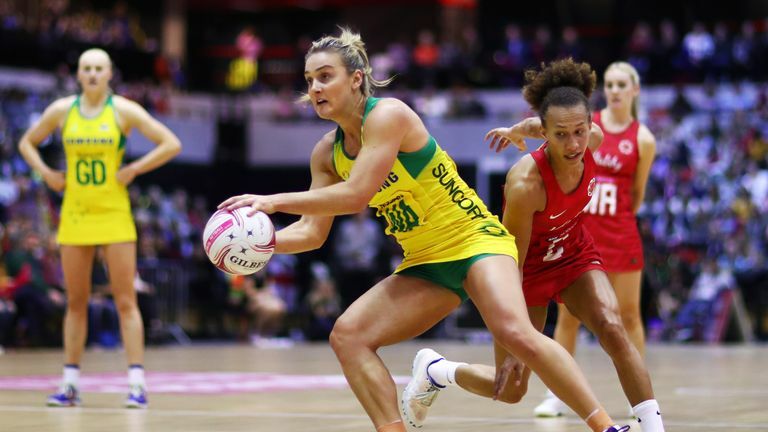 Whether or not we will see Dunn on the world stage in Liverpool will remain to be seen - that is up to Tracey Neville and her coaching staff to decide. But for now her presence in Wasps' title-chasing squad will be vital and her 'unorthodox' style will remain front and centre in the Vitality Netball Superleague.